tool works. Your curious learner will enjoy every minute spent playing with this educational toy! your child plays this toy because it's completely safe and suitable for your toddler. Features volume that can be muted or set between low and high. Comes with a pull-out drawer to gather the pieces in one neat spot. Power tools create awesome sounds and lights to captivate your kid's attention. Perfect for use at home, in school, the car, and anywhere else! A great gift to keep your child entertained while learning new skills. Make learning a fun and wholesome experience for your little one with this premium toy workshop. Click 'Add to Cart' now! KEEP THEM ENTERTAINED: The Little Artisan Game workshop for kids features cool tools your kids can play including a screwdriver, hammer, wrench, and screws. Let the fun begin as your curious tot discovers what each tool can do - and there are fun sounds produced to match each tool, too! 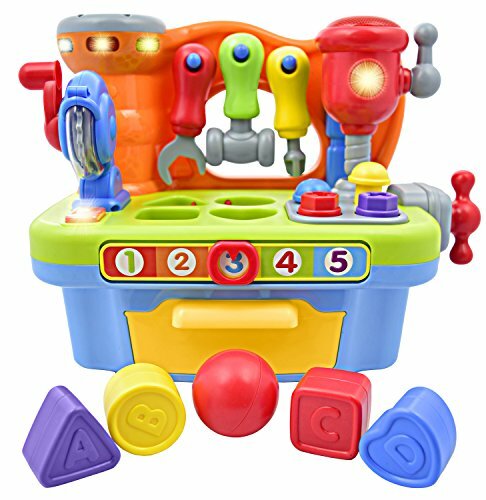 SHAPE SORTER: Drop each block to its appropriate slot in the toy workshop set and music plays every time kids get it right! The name of each shape is also called out whenever it fits in the right slot, so your child will learn to call it by the correct name for easy familiarization. COUNT 'EM RIGHT: There is a slider that can be moved from numbers 1 through 5, which calls the number out and plays different tunes at the same time. This makes the pretend workshop a great number learning toy and promotes fine motor skills development as the kids move the slider to discover cool sounds. SUPER INTERACTIVE TOY: What makes this deluxe workshop for kids more exciting than the others in the market is its interactive features. The little ones effectively learn ABCs, numbers, colors, and shapes through sounds and music. There are cool tunes that play to keep your kids engaged for hours on end. SATISFACTION GUARANTEED: If you need a fun and educational gift for kids, look no further and buy this premium workshop table toy today! With kid-friendly features such as the bright colors, catchy tunes, and smooth edges on each part, you can expect to get the best value for your money. If you have any questions about this product by CoolToys, contact us by completing and submitting the form below. If you are looking for a specif part number, please include it with your message.